CEILINGS + ROOFS | Brand Insulation Inc.
Searching for a high-performance, green insulation solution? 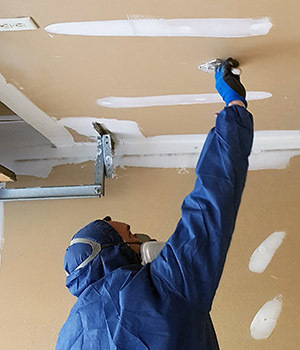 Dense-pack blown-in cellulose is the best choice for garage ceilings and flat roofs where insulation and/or soundproofing is required. It easily fills in cracks and crevices to provide a seamless barrier. Cellulose insulation is a safe and green choice made from up to 85% recycled paper that has been treated with boric acid and borate to make it flame, pest and mould resistant. It is one of the most eco-friendly blown-in insulations in existence because not only it is made from a high percentage of recycled materials, it is very energy-efficient to produce. It is the best insulation option for garage ceilings and flat or lower-pitch roofs. And it is also excellent for soundproofing. Is poor insulation the reason the room above my garage is so cold in the winter? It’s quite likely the cause, though if the building is older, its age and how it was built may add contributing factors. Brand Insulation can investigate the cause and offer solutions. Can I install dense-pack blown-in cellulose insulation myself? Installing dense-pack blown-in cellulose insulation yourself is not advisable. We recommend contracting an experienced installer who has the knowledge, experience and proper equipment to do the job right the first time. 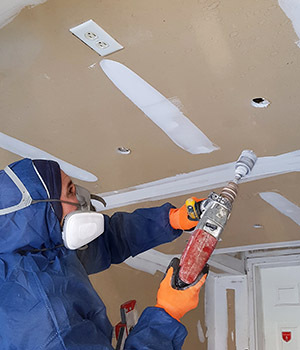 In addition to serious damage you may accidentally do to your home (such as cutting electrical wires, plugging air ducts, or damaging drywall), the overall effectiveness of any insulation material is directly linked to the quality of the installation process. Brand Insulation’s trained, professional installers have more than 10 years experience, and we warranty our work. and into a building in the summer. A higher R-Value ensures more comfortable environment and greater energy savings. How long does it take to install blown-in cellulose? Do I have to leave my home during installation? While it will depend on the size, design and construction of your home, the installation of blown-in dense-pack cellulose typically takes less than a day. You can remain in your home while the installation is being done. Three steps to a quieter and more comfortable home in less than a day! Holes are drilled in the ceiling between each set of joists. 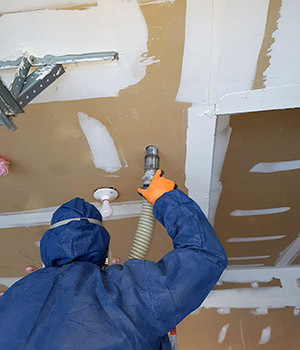 Blown-in, dense-pack cellulose insulation is carefully injected. The walls are rough-patched. Paint services are available upon request.